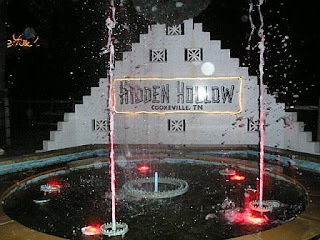 Sadly, as I write this, rumor has it that Hidden Hollow no longer exists. Throughout my college days at Tennessee Tech in Cookeville, TN, my best friend, Rachel, and I would often shirk our homework responsibilities and escape to this rural retreat located off Mt. Pleasant Road southeast of Cookeville. 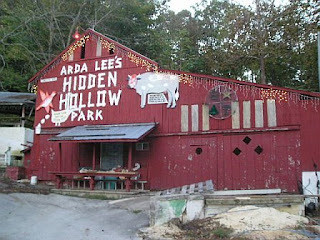 Hidden Hollow was created by Arda Lee in the 1970s as a tribute to his mother and is a popular destination at holidays due to the elaborate light displays. The private park includes a 50-foot tall illuminated cross at the top of a mountain (this can be seen from I-40), outdoor wedding chapel, petting zoo, game room, large swings over a pond, and various odd sculptures. Words cannot describe the crazy things you can find at Hidden Hollow. Did I mention that bunny rabbits roam the park? Rachel and I had a theory that Arda Lee had magical powers and misbehaving children were turned into rabbits and doomed to a life of roaming Hidden Hollow. 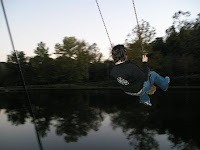 We'd often go to the park at sunset, and our favorite thing to do while visiting was to swing over the algae-ridden pond at dusk as soon as the millions of Christmas lights illuminated the park for the evening. 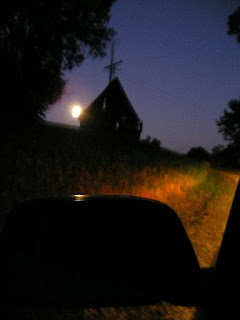 Then we'd drive up to the top of the mountain where the illuminated cross gleamed against the night sky. Sadly, during our last year in school, Arda Lee passed away and we found the park in major disrepair. 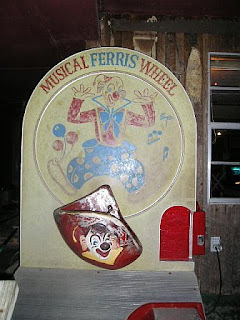 Last I heard, the park had closed but was going to be re-opened for weddings and events. I can only hope that the park "art" remains as is for the public to enjoy for years to come. I leave you with some photos of interesting "objects" found on the grounds, and ending with a shot of the cross taken at the top of the mountain. 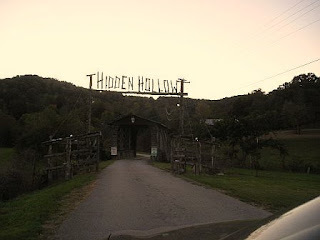 Hidden Hollow does still exist. Vince Taylor (owns Vinnie T's there in Cookeville) bought it at auction a year or so ago when Arda Lee's family could no longer afford to keep it open. I don't know day-to-day operations are run now. Vince had some plans, but I don't know exactly what he did.